Our curriculum adheres to state standards in all subjects, including the core areas of language arts, mathematics, science, and social studies. We also offer instruction in art, music, agriculture, and physical education. For more information about state standards and assessments, please follow the links under Academic Resources. Every PAAS student must complete (and pass) the following core classes for promotion from middle school to high school. Students will complete three middle school or higher courses in English. These courses emphasize literature, composition, and technical text. Students will complete three middle school or higher courses in mathematics. We offer at least one high school level mathematics course for which students may earn high school credit. 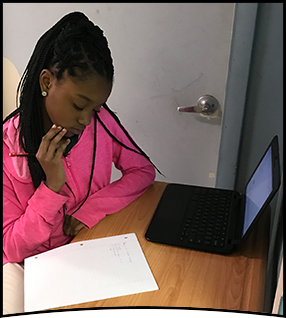 To earn high school credit for an Algebra I course, a middle school student must pass the Algebra I end-of-course assessment. To earn high school credit for a geometry course, a middle school student must pass the geometry end-of-course assessment. Students will complete three middle school or higher courses in social studies, one semester of which must includes the study of state and federal government and civics education. One of these courses must be at least a one-semester civics education course that a student successfully completes in accordance with s.1008.22(3)(c) and that includes the roles and responsibilities of federal, state, and local governments; the structures and functions of the legislative, executive, and judicial branches of government; and the meaning and significance of historic documents, such as the Articles of Confederation, the Declaration of Independence, and the Constitution of the United States. Students will complete three middle school or higher courses in science. To earn high school credit for a Biology I course, a middle school student must pass the Biology I end-of-course assessment. Homework is a vital part of a student’s educational career. Putnam Academy students will have homework almost every night. Because we know your home and family time is also extremely important, the assignments will be meaningful, relevant, and will reinforce learning. We expect most students will be able to complete it within a few minutes. Teachers will not assign unnecessary busy work for homework. We thank you for your support by insisting that students complete their homework assignments. Putnam Academy offers several courses through which students can earn high school credit. These courses include Algebra I, Biology I, Lifestyle Fitness, Band III, and Agriscience Foundations I.